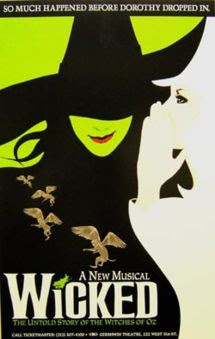 I went to see the musical "Wicked" last night with my friends Jen, Briana, Ryan and Amy. We took the Metro train from Pasadena to The Pantages in Hollywood. A big thanks to Jen for getting us to and from the theatre in one piece. It was quite an adventure. From the young man we met on the train on his way to hear the band Korn to the urine streaked man who was having a full on conversation with his white Bic pen. Not to mention the two scary looking Gothic women with dreads, piercings, black fish net stockings, black platform shoes, spiked bracelets and scowls on their faces. It was a trip we won't soon forget. But, back to the show. Wicked is a spectacular musical based on characters from "The Wizard of Oz". It's a story of love, honor, racism, being an outsider, good vs evil. It is mostly a story of friendship. And I wanted to thank my four friends for a wonderful time together last night. Ahhhh. Schucks. You are so sweet. Thanks for the birthday wishes. I'm honored to have gone with you all to see Wicked. It was truly an awesome production. And the Metro: Yeah, I agree. Some crazy folks out there. But you forgot to mention the lovely stench of urine near the elevators.